Dirt is extracted not rubbed deeper into your carpet from a bonnet. When you have your carpets cleaned by Nichols carpet cleaning, the only things you lose are spots, stains, odors, and ground in dirt! We clean all types of upholstery with outstanding results. Deep down steam cleaned dirt is extracted, not just rubbed down deeper into your upholstery from a bonnet. Don't leave your dirty upholstery on your clean carpet, let the pros at Nichols carpet cleaning take care of all your upholstery needs! Don't be embarrassed by your homes dirty and dingy tile, stone, and grout. Nichols powerful equipment gets your hard surfaces sparkling clean! Why? Because you're bombarded with misleading advertising, confusing claims and simply bad information. From super-low prices and high-pressure sales - to unqualified technicians and near-worthless methods - how do you ever find a qualified, competent, professional carpet cleaner? 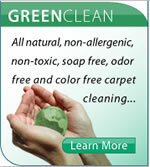 Well show you 5 Costly Misconceptions about carpet cleaning and how to avoid them. We offer carpet cleaning for the entire Tri valley we wrote this guide to help you better understand carpet cleaning. Now, with this information, you can make an informed, intelligent decision. Click Here for the 5 biggest misconceptions about carpet cleaning. Our company receptionist tries to answer every call; unfortunately there are times we can't get to every call. Your call is very important to us so we will return your call as soon as possible usually within 10 minutes!! 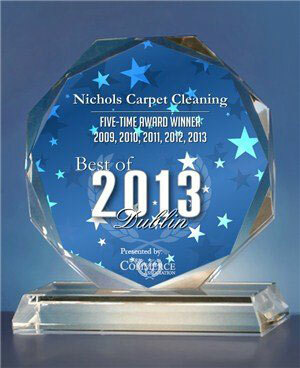 That's enough reasons to call Nichols Carpet cleaning!!! Only 1 in 1,000 businesses receive this award 5 times in a row!